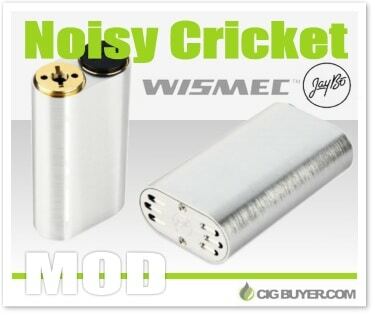 At first glance the Noisy Cricket Mod by Wismec & JayBo may seem like a boring, uninspiring mechanical mod, but looks can be deceiving. This unregulated box mod runs off of dual 18650 batteries in series, providing double the voltage! Ideal for cloud chasing and advanced coil builds, it may have a simplistic appearance but it includes finer touches such as a precisely engineered aluminum alloy body, peek insulated SMPL style fire button, unique linkage set, hybrid 510 adapter and six large bottom ventilation holes.